Price For: Each Watts: 120 Filter Media: HEPA/Activated Carbon Standards: ESD safe Hz: 50/60 Air Flow: 168 cfm Item: Soldering Fume Extractor Height: 15" Number of Inlets: 2 Features: 4-Speed Mode Max. Exhaust Hose Length: 10 ft. 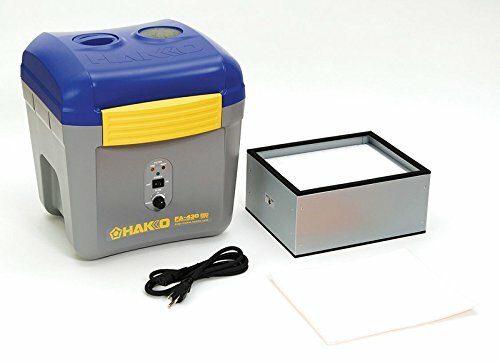 Application: Soldering Fume Absorption Input Voltage: 120VAC Sound Level dBA: 44 to 53 Inlet Diameter: 3" Depth: 13"
If you have any questions about this product by Hakko, contact us by completing and submitting the form below. If you are looking for a specif part number, please include it with your message.